Simple Electrical Circuit iphone x case by Andrew Lambert Photography. Protect your iPhone X with an impact-resistant, slim-profile, hard-shell case. The image is printed directly onto the case and wrapped around the edges for a beautiful presentation. Simply snap the case onto your iPhone X for instant protection and direct access to all of the phone's features! 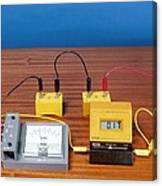 There are no comments for Simple Electrical Circuit. Click here to post the first comment. 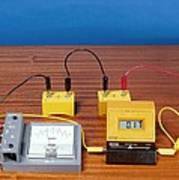 Simple electrical circuit. 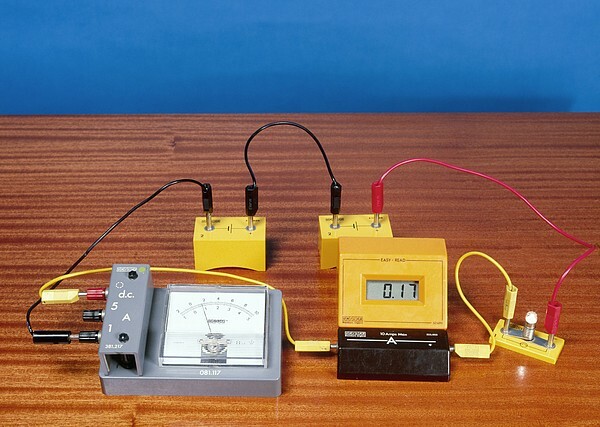 The circuit consists of two cells (batteries, small yellow boxes), which are powering the electric light bulb (bottom right), an analogue ammeter (grey, left) and a digital ammeter (black and orange, centre right). 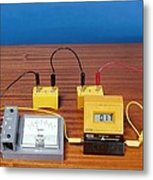 The ammeters measure the electrical current in amperes.